For gamers, getting immersed into the action is the whole point of the fun. So it is essential to have a monitor that can keep up with the intense demands of today’s games, without lagging or stuttering, and completely absorb players. 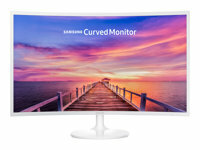 Samsung’s curved monitors' curve with a radius of 1.8 meters helps to create a sense of surrounding the player, pulling them all the way into the action of the game.In addition to that curvature technology, each of Samsung’s gaming monitors helps prevent eye strain and fatigue with embedded flicker-free and Eye Saver technologies.